For once let's start right at the end. 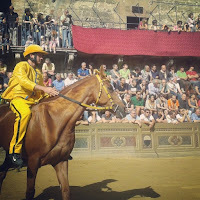 The video of the final horse race of Siena's Palio says more than a thousand words about this incredible event. An event some English speakers still call 'the Polio of Siena'. No worries guys. 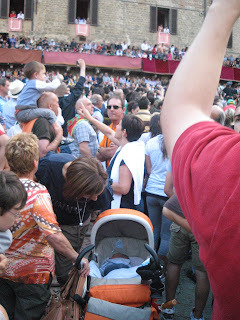 Siena's Palio is indeed infectious, but I can assure you it's no disease. Impressive isn't it? And to think that the whole thing lasts for just over a minute; albeit a spectacular minute. 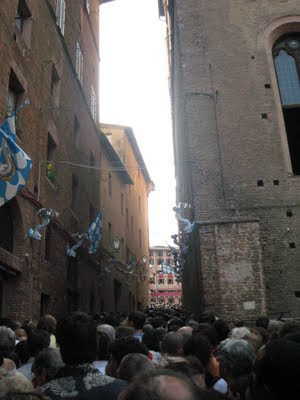 Now here's a confession: I've been living in Tuscany for the last 12 years without ever making it to Siena's Palio - until last Saturday that is. The truth is I'm no fan of crowds. Last time I was in one I still lived in Switzerland and it took exactly five minutes for a beer bottle to land on my head (so much for Swiss Ice-hockey fans). 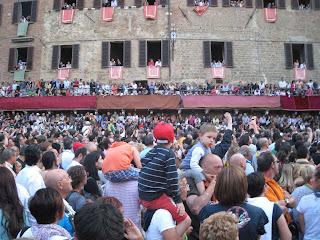 And there is no way you can avoid the crowd if you want to attend the Palio live on piazza del Campo. Yes there are people who pay a lot of money for a prime spot on a roof-top terrace or at a window - this year F.C. Barcelona's trainer Pep Guardiola was spotted between the rich and beautiful - but that's cheating really. And why should you if you can have it all for free. 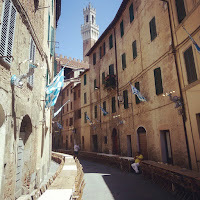 Different to many other festivals in Tuscany there is no entry fee to access Piazza del Campo during Palio. Standing up that is. 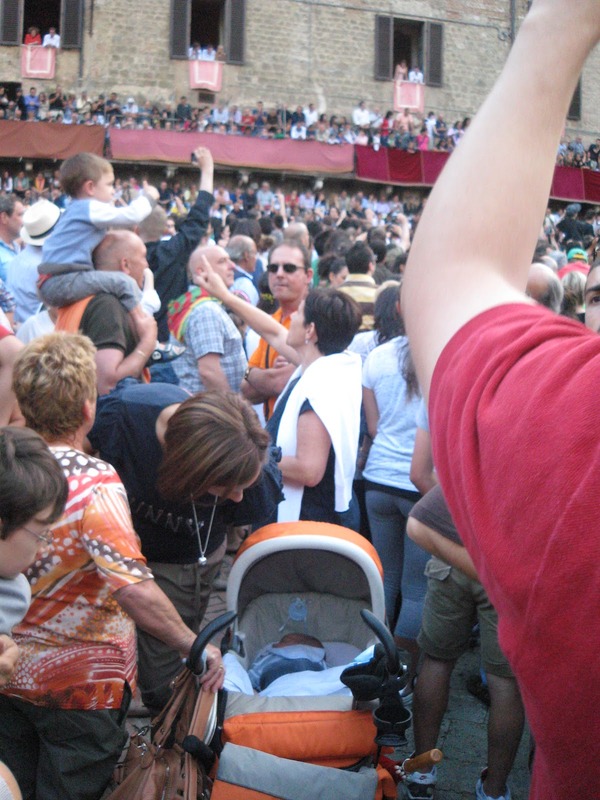 Whilst my Tuscan native loves the Palio, I was able for the last 8 years to avoid the issue by having the perfect excuse: either I was pregnant or breastfeeding or pregnant and breastfeeding again; and once through with that the kids were just too small. The city of Siena definitely agrees with me on this one (no kids on the square during Palio - see picture). But for whatever reason I totally miscalculated my dates this year and sent the kids off for a Swiss holiday with their relatives north of the Alps - and that's exactly where they were on the 2nd of July, the date of the first Palio each year. And without me - DAMN! What can I say? 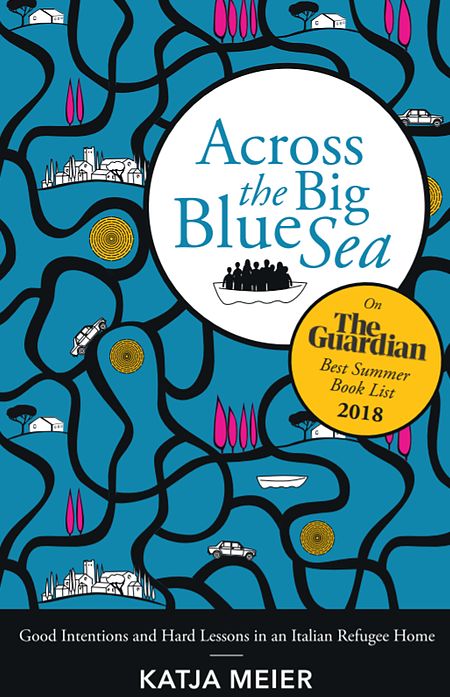 I packed my homeopathic first aid kit and lots of water, put on a comfy pair of shoes and told my Tuscan native that I was ready to fight my phobias publicly on one of the most beautiful squares the world has ever seen. Once you are on Piazza del Campo things are not too bad. You don't have to stand on anybody's feet and you don't have to smell anybody else's bad breath. 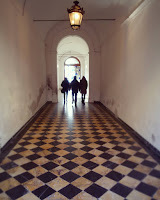 But getting into the Piazza... Towards the evening there is only one access to the square: a tiny medieval street which lends itself beautifully to getting jammed up. During the afternoon other access streets are still open, but I'm not easily excited by hours of pagentry on a hot square. Therefore we had to squeeze our way through minuscule via Dupré together with the few other people who care more about horses than people dressed up in medieval gear. The 'I can't breath I'm being stuck'-panic was in full swing when I managed to remember my homeopathic first aid kit. Just how do you get to the first aid kit in your bag when you can't move, let alone breath? It's rough to realize, but even we Swiss can lack in preparation (on rare occasions). So for once I wasn't saved by homeopathy, but by an elderly Sienese standing right in my face (not that he chose to do so). The man, surely in his 80ies, managed the crowd without any signs of discomfort; if anything he was annoyed by MY discomfort: 'Another stupid tourist who can't handle this!' He didn't say that, but I do know the meaning of that look. A look which is given all over the world to intruding and out-of-place foreigners. The Sienese, well known in Tuscany as a rather uppish crowd, are prime at delivering it. This was the last straw! In a positive way. I may be a foreigner, but I'm the proud mother of two Tuscan half-breeds. And just when I finally decided to toughen up, our part of the queue got pushed and shoved from the alley into the square and it was - I normally try to avoid this word as it seems to work well only with Americans - AWESOME! Awesome, awe-inspiring, the whole lot. 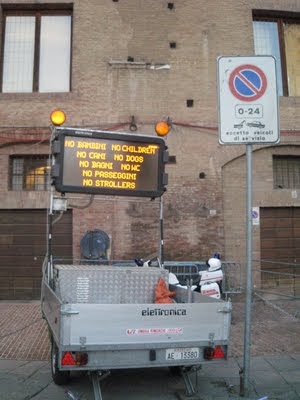 Ah yes, did I mention that the city of Siena recommends not to bring small children onto piazza del Campo during the Palio? Apart of the beauty of the square and the adrenalin saturated atmosphere, the most intriguing thing was the sound once the long-expected horses arrive on the square - or in fact the lack of sound once they arrive. The whole square goes silent, as by command. It felt like a sacred moment, and I guess it must be to the Sienese (it's the moment when everybody waits for the starting position of their Contrada's horse to be unveiled). If you are coming to Siena anytime this year you'll run into groups of people singing and celebrating just like this - it's the Contrada dell'Oca (Goose) which is celebrating its 2011 victory of the Palio di Provenzano on a daily base. The Palio takes place twice a year (2nd of July and 16th of August) and has been celebrated regularly for about the last 350 years. Before the Palio, bullfights were popular on the square. However they were outlawed in 1590 (wondering what the Spanish would say about that one). For more info about the Palio check out its Wiki Site or one of the traditional Sienese sites about the Palio with videos of the last 50 years of the famous race that even featured in the 22nd James Bond film 'The Quantum of Solace'.